The historian Jorge Lardo and Larín, on the etymology of the word Chalchapa, says that in Nahuatl language it means river of Jadeítas, chalchihuit, jadeíta, and appeared River. Chalchuapa was a village with the pre-Columbian Pokomame people founded at the end of the century V and VI and later conquered by the Pipils in the late fifteenth century. Chalchuapa is the head of the municipality of the same name, located west of the city of Santa Ana, in a plain north of the Sierra Apaneca-Ilamatepec, and its elevation of 700 m above sea level. It has a connection with San Salvador using the Pan-American highway (CA-1) to the west. The city Chalchuapa is in the central area of the municipality, the north is a mountainous area with the volcano Chingo at the border with Guatemala; in the middle we have the majority of archaeological sites in the western part of the El Salvador, these being: Tazumal, Casa Blanca, Pampe, El Trapiche and Las Victorias, dating from the classical period. 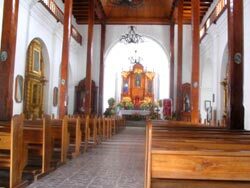 During colonial times the town of Chalchuapa belonged to the province of San Salvador, since 1824 it was definitely incorporated into the department of Santa Ana. One of the first indications we have from Chalchuapa is that of Lic. Alonso Lopez de Cerrato in 1548. By this time the wealth of Chalchuapa was based on the cultivation of cocoa and corn, herds of cattle ranchers, and chickens. Something that has not changed much, agriculture remains its main line of production. Chalchuapa had a very active trade with Guatemala and Honduras, which would provide the luxury of building the magnificent temple of the Apostle Santiago and some of its residents built good houses.